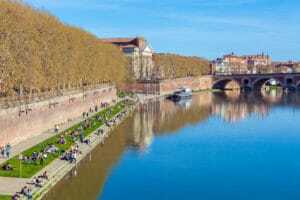 Toulouse lies in the heart of the south western France, just north of the Pyrenees, between the Atlantic Ocean and the Mediterranean Sea. Its other name is La Ville Rose (the pink city), named so because of the pinkish hue of the city buildings built with the pinkish terracotta bricks. 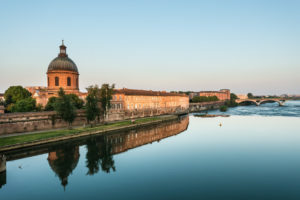 Located on the banks of the River Garonne, Toulouse is 150 kilometers away from the Mediterranean and is a city filled with great art, top sciences and a very cool style. We set out in the car from Montpellier to Toulouse, with a short pitstop in the famed Medieval fortified town of Carcassonne along the way. It’s a picturesque journey with lots of splendid views and points of interest. That was not our mission today, but I will talk about Carcassonne on another day. 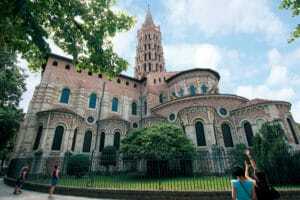 We were off to check out Toulouse and see what La Ville Rose has to offer. In just under two hours, we arrived at our destination and checked into our hotel. We stayed in the Wilson area, not far from the Marché Victor Hugo and perfect for walking to many of the city’s important landmarks. 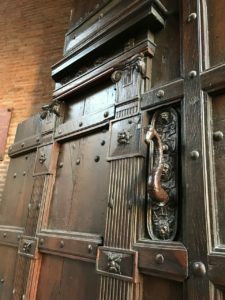 The Theatre du Capitole, Couvent des Jacobins and the Fondation Bemberg were all easily within walking distance and so we checked those out first. 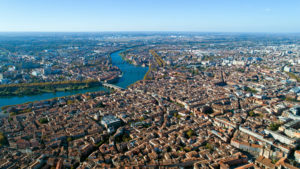 A very interesting fact about Toulouse is that it is THE world capital of the aeronautics and space industries. 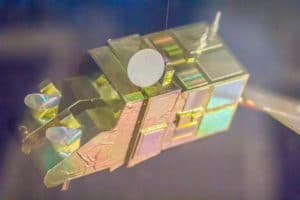 It boasts being home to Airbus, the Galileo (the EU’s global navigation satellite system) and SPOT (Satellite for Observation of Earth) just to name a few. 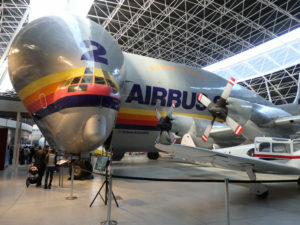 Some of the first airplanes were flown here in Toulouse by Aéropostale, which have changed many times and grown into the company, Air France, the renowned Airliner. 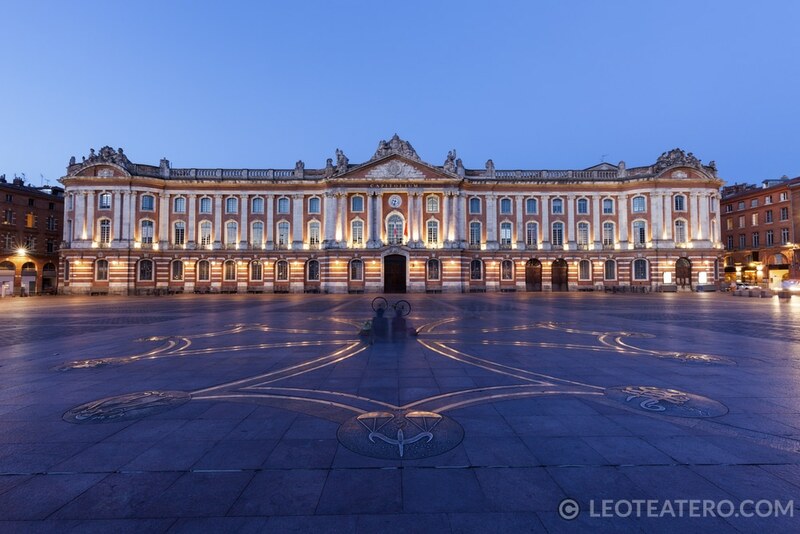 In the First World War, Toulouse played a vital role as the headquarters for building the first airplanes for the airforce and was a played another crucial role as home to the Resistance movement during the Second World War. It is also the fourth largest city in France with just over 1.3 million people in the city and surrounding areas. 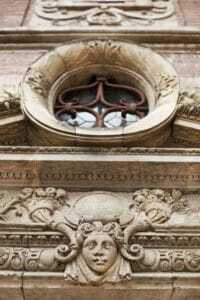 With over 2,000 years of history, the Ville Rose is home to other numerous artistic treasures, monuments and even little known gems, that can be discovered in the tiny streets and small squares and a huge number of mansion houses. 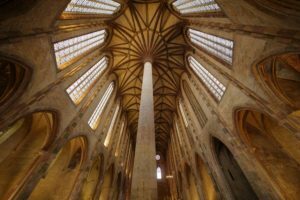 It is a well-preserved city with three sites that appear on the UNESCO heritage list: the famous Canal du Midi (ideal for boating or cycling) or the Basilica of Saint- Sernin (the largest remaining Romanesque Church in Europe) and lastly the Hôtel-Dieu Saint-Jacques Hospital. 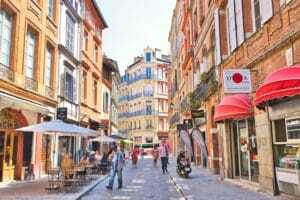 Located in the Garonne Valley, Toulouse was a central point for trade between the Pyrenees, the Mediterranean and the Atlantic since at least the Iron Age, making it a very desirable place for merchants and traders. 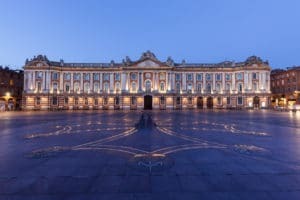 Toulouse has been a capital is some form or another for centuries. In the 5th century it was a capital within the Roman Empire. Later it became the capital of the Duchy of Aquitaine and eventually joined France in the early 13th century. 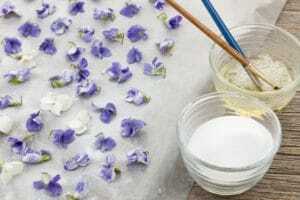 Between the 15th and 16th Centuries, Toulouse grew rich from tradesmen selling pastels, the rare Toulousain blue dyes (woad), cereals and textiles. 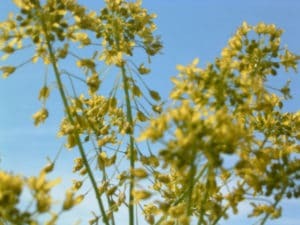 Woad, also known as isatis tinctoria, also Asp of Jerusalem was the only plant capable of dyeing textiles blue, the colour of royalty and nobility since the Middle Ages. 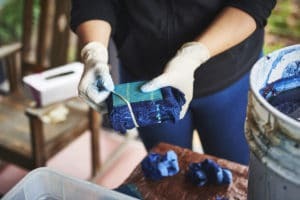 Of course, like all good things the blue dye market came to an end with a market collapsed as of the result of the importing of Indigo from India. 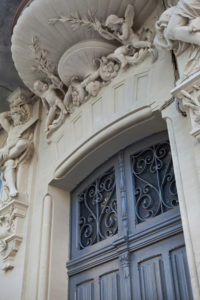 These merchants, known as Capitouls built grand mansions and houses paving the way for both architecture and the fine arts to flourish in Toulouse. Afterwards it was dominated by religious wars until the end of the Napoleonic Wars, where it was the site of one of the last battles between Napoleon and the rest of Europe. In the mid 19th century it transformed into a modern French city when it launched the Matabiau Train Station, which is still in operation today. 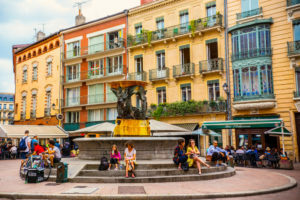 The city is modern, pretty and fun, with lots of little jazz and rock clubs too and or course, the wonderful wine bars that are everywhere in the south of France. 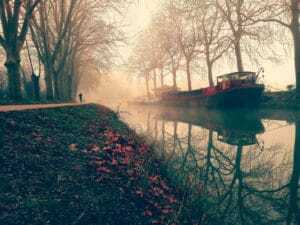 While our journey was short, we did manage to squeeze in a bike ride along the Canal du Midi. Something a must for us! 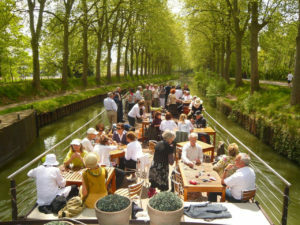 The canal running from the Garonne River to the Mediterranean Sea, was built on the order of Louis XIV is one of the few still in operation today. It’s gorgeous, peaceful and calm. Boaters seemingly drift down the canal to unknown destinations. It’s definitely the most charming way to visit the city and the south of France. After our lovely bike ride, we stopped to bask in the sun (and for apéro of course!) at Le Bar Basque, along the banks of the Garonne by the Pont Neuf. 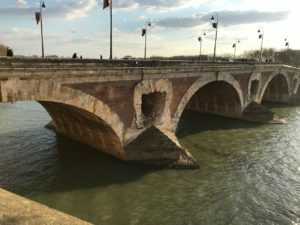 Pont Neuf is the oldest bridge in the city of Toulouse and was erected in the late 16th century. It is a place to walk and stroll along the river, where the youth, artists and other locals play music, skateboard, walk their dogs or just lie in the sun. 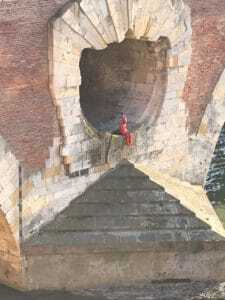 It was on one of these strolls, that we spotted this fantastic little creature sitting patiently under the Pont Neuf. 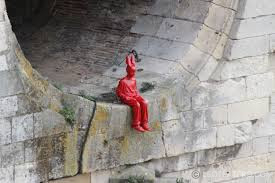 It is a life-size mannequin complete with rabbit ears, painted entirely red and placed on the first of the bridge’s pillars, which is only accessible by water. The artist, James Colomina created and placed several other art installations around the city and in many other cities, like Paris too! Have you been able to spot his signature red pieces? 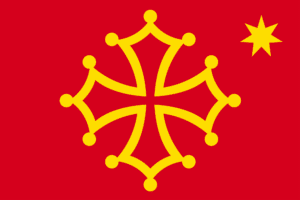 The Toulouse Cross or Languedoc Cross, is a Greek cross made up of 12 branches representing the 12 months of the year, the 12 hours of the day or the 12 signs of the zodiac. 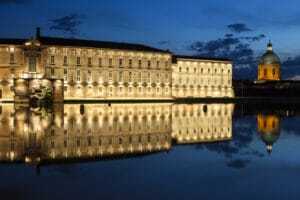 Today it is the emblem of the city of Toulouse and of the Midi-Pyrénées region. A huge Occitan Cross made by Raymond Moretti extends across the Place du Capitole located in the central part of the city. It’s a beautiful art installation worth viewing at dusk or at night. This is the place if you prefer the hustle and bustle of the big city. Be sure to check out Place du Capitole and its gorgeous arches, also home to the many large restaurants and terraces. 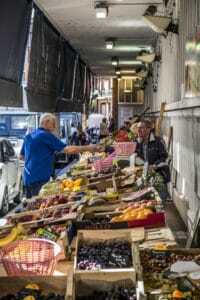 They are always animated and the surrounding streets filled with little shops, charming restaurants and people galore. One of the things I love best about large French cities is that they have Brasseries serving the best in regional French cuisine. Toulouse has one of these exact places in Le Pyrénéen, established in 1925. We had a fantastic dinner at this bustling bistro, with smartly dressed waiters and guest in an exquisite art-deco décor. The stain glass ceilings are incredible, and the meat and seafood out of this world. 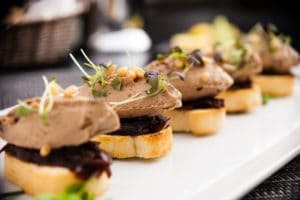 Of course, I had the escargot de Bourgogne (snails in garlic butter) and the Magret du canard grillé with a crown of foie gras (grilled duck with liver pate) with a lovely Chateau La Voulte Gasparets “Romain Pauc”. You can see my full and complimentary review of Le Pyrénéen here at TripAdvisor. 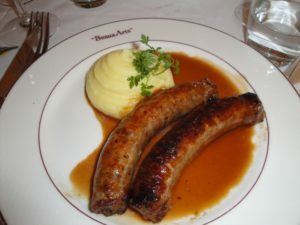 The regional products that are famous here include the Toulouse sausage is one of the southwest France’s great culinary contributions; it’s generously seasoned, meaty and completely free of additives. 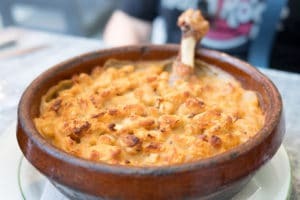 Also of note is the legendary Cassoulet, which includes Toulouse sausages. It’s a medley of meat including duck, goose and sausages. 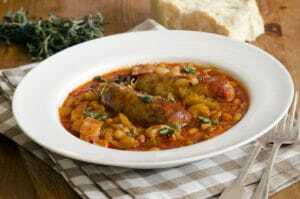 This is cooked down in a terracotta dish with large white haricot beans into a thick, rich broth; accompanied by red wine from Fitou or Corbières and you’ve got the perfect meal, especially for a winter night. 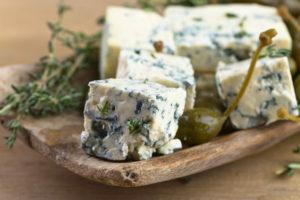 There’s a great deal more to the region too, including duck everything (foie gras d’oie, magret du canard and confit du canard), Noir de Bigorre (ham from black pigs), Roquefort cheese to violet products, fermented into vinegar for colourful salad dressings or made into sugared candy. And of course their wonderful desserts like Gateau Fénétra, la croustade aux pommes and les pavés du Capitole (chocolates). Our time in Toulouse was short, only 48 hours, but it was jam packed and fantastic! It’s a young, fun and lively place with great nightlife, dynamic cutting-edge technology and a huge amount of culture and style. 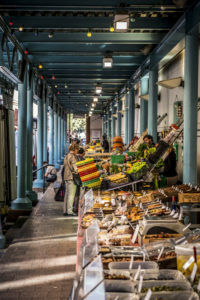 It’s also a showcase of architecture, heritage, culture and character, not to mention a great place to get away to a big city with it being overwhelming. Check out La Ville Rose one day, you won’t be disappointed. 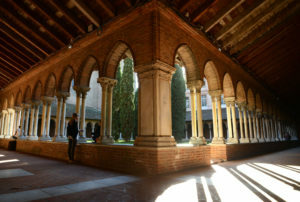 PS – A big thanks for the Toulouse Tourism Office for the use of many of these photos. The rest are mine. Great article, Leo! 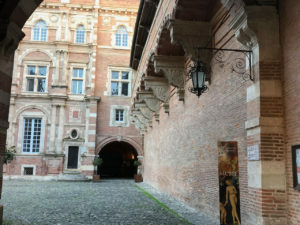 It’s funny how I’ve been to Toulouse so many times and I’m still discovering things (thanks to you!). You’re pics are great too!